Ship a motorcycle to or from Puerto Rico the fastest and most affordable way. Servicing San Juan and every state nationwide, we offer the most convenient motorcycle shipping options. We specialize in shipping all types of motorcycles, scooters and mopeds to and from Puerto Rico. 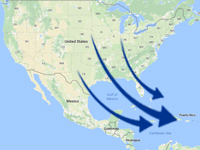 Service from the San Juan port to any residential or business location in the US. 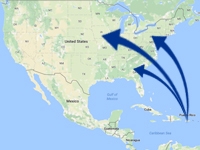 Your motorcycle will be shipped from San Juan and delivered to any stateside destination. 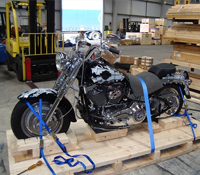 Upon arrival at the mainland port, a certified carrier will load your motorcycle and complete the delivery to any residence or business location within the United States. Service from any residential or business location on the port in San Juan. Your motorcycle will be picked up by a certified carrier directly from your specified location and delivered to the stateside port. Upon arrival at the stateside port, your motorcycle will be carefully loaded onto the vessel and secured until it reaches the San Juan port. "Impressed with the way our bike was handled"
We're very happy we found a reliable way to relocate our motorcycle. "Exceptional transportation from start to finish"
We've used PRCT 3 times and the service has always been great. "Great experience with PR Car Transport"
"Already told my brother and 2 friends"
I was amazed with how quick PRCT delivered my bike to San Juan. "Shipping a motorcycle should always be this easy"
I was helping a friend ship a motorcycle and Premier made it super easy. With multiple sailings between San Juan and the mainland every week, we offer the most convenient options when shipping a motorcycle to or from Puerto Rico. Servicing San Juan with weekly availability to accomodate any schedule. Questions About Your Puerto Rico Motorcycle Transport? Call (904) 322-7644 to discuss your transport with a shipping coordinator today.